Voting ends at 4 p.m. ET on Thursday. Real fans have voted hundreds, if not thousands, of times, and Votto’s lead remains slim. It’s not too late to do your part and join this elite group of Votto supporters: start now! 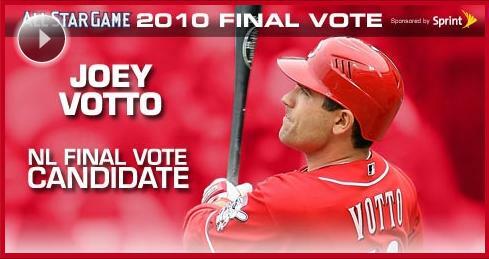 Posted in Cincinnati Reds, Joey Votto, Vote Votto. The Daily Brief: Best. Snub. Ever. Thanks to a sore back putting Aaron Harang on the disabled list, Matt Maloney was called up from the Louisville Bats for the emergency start. Maloney did okay, allowing 1 run through the first 5 innings until he tired in the 6th. The Reds offense never could get anything going against Johan Santana, the Reds ended up losing to the New York Mets 3-0. The Reds attempt to win the series against the Mets today when they send out Bronson Arroyo. We’ll see if one of their starters having his normal routine uninterrupted will help Cincinnati or not. New York will send out “All-day, all-night” Jonathon Niese. First pitch is scheduled at 7:10pm EDT. After Joey Votto was snubbed for the 2010 All Star game, the Reds wasted no time in marshaling the troops. They recorded spots from many of the players to air during games, encouraging viewers to vote Votto for the final spot, and they teamed up with the Boston Red Sox. Even, ESPN, a station the RHM household stopped watching because it never showed anything about the Reds, was talking about Cincinnati and Joey Votto. This slight could be about the best promotional thing to happen for the Reds since the Ken Griffey Jr trade. Of course, knowing how that ended, let’s hope that Votto making it to Anaheim this year brings much happier returns. Do your part: Vote for Votto here. Voting ends tomorrow at 4pm. By going 12-11 in April, 18-11 in May, and 14-13 in June, the Reds had winning records in the first 3 months of the season since 1992. That team finished in 2nd place with 90 wins, in case you were wondering. Comments Off on The Daily Brief: Best. Snub. Ever.